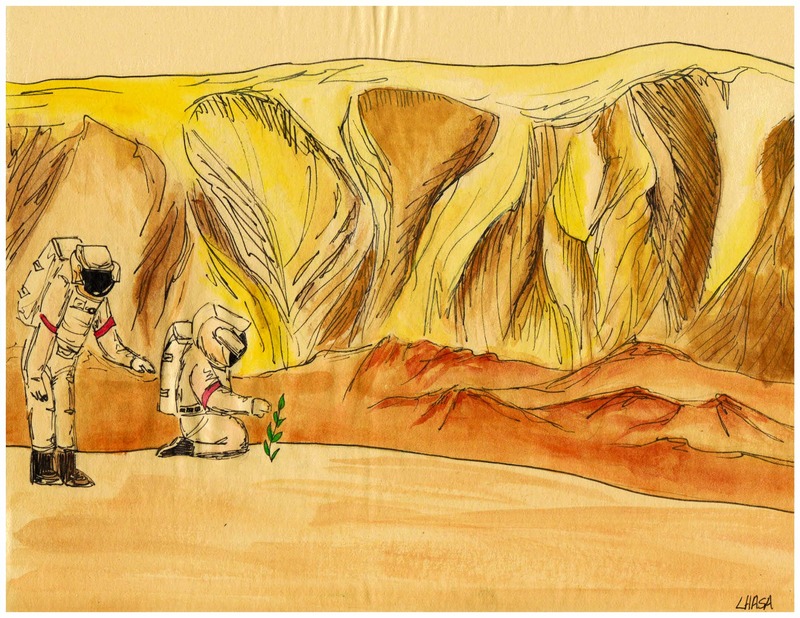 Over 140 students from around the world entered the Mars Society's Student Mars Art (SMArt) contest over the past few months. The objective of the international competition was for students to depict any phase of the human future on the planet Mars, from first landing to full settlement. The contest was divided into three groups: Elementary (grades 4-6), Middle School (grades 7-9) and high school (grades 10-12). The winners for all three categories are now being announced below. To view the first, second and third place winners from each group, please click here. 1st place: Lhasa Gabrielle Simard (Canada) for "Reve d'un Explorateur" & "Mars Green"
2nd place: Hannah van Gemert (Holland) for "Household", "Peace" & "Pursuit"
3rd place: A tie between Zeynep Betul Kiraz (Turkey) for "New Earth, New Dreams" & "Mars Airport" and Jessica Liu (U.S.) for "Stargazing"
1st place: Hayley Reed (U.S.) for "A New World" & "Martian Glacier"
2nd place: Derin Lal Ozoguz (Turkey) for "Colours of Mars"
3rd place: Yi Shi (Ghana) for "Life on Mars"
1st place: Worth Lodriga (Philippines) for "Where No Man Has Gone Before"
2nd place: Devina Manchanda (India) for "New Life on Mars"
3rd place: A tie between Aarna Kakkar (India) for "Dream of the Future", Gaurish Anand (India) for "Farming on Mars" and Gopika Chawla (India) for "Dream of Success"
Cash prizes of $1000, $500 and $250, as well as trophies, will be given out to the first, second, and third place winners of each category. There will also be certificates for those receiving honorable mention. Winners are invited to come to the 2017 International Mars Society Convention at the University of California, Irvine September 7-10 to display and talk about their art. All of the winning works of art will soon be posted on the Mars Society website in the near future and may also be eventually published as part of a book of Mars art.